26/11 will always be remembered for the courage displayed by our security forces in overcoming the siege at the Taj Mahal hotel, Oberoi and Chabad House in Mumbai. For the elite National Security Guard, which was called in to defeat the terrorists, fighting a battle in unfamiliar terrain came with a heavy price attached: The loss of two commandos, Major Sandeep Unnikrishnan at the Taj and Havildar Gajender Singh Bisht at Chabad House. Being in the forefront of the National Security Guards operations at the Taj Mahal Hotel in Mumbai, Major Sandeep Unnikrishnan not only waged a valiant battle against the terrorists but also did his best to save his injured colleagues and in the bargain lost his life. He showed the real warrior in him before laying down his life. Thirty-one-year- old Major Sandeep is the only son of retired ISRO officer K. Unnikrishnan, who is settled in Bangalore. His father told presspersons: "I lost my son in Mumbai on Friday. Though I do not like to call him a martyr, I can proudly say that he has done something for this country." He was informed of the death of his son by the Deputy Inspector-General of Police (National Security Guards). According to information reaching the family, "Major Sandeep was leading a team and during the operations two of his colleagues sustained bullet injuries. In a bid to save them Sandeep turned back. The bullets fired by the terrorists pierced him. On November 26, he had called us and said that one of his childhood friends is getting married in the city on December 17. He had planned to attend that marriage," Mr. Unnikrishnan said. Major Sandeep was ambitious, talented and a brave soul, said his friends and neighbours. He joined the National Defence Academy and was commissioned in the Bihar 7th Regiment in 1999. He was drafted to the NSG after his gallantry was recognised," Kiran Srivasthav, a childhood friend of Major Sandeep . According to Anirudh Uppal, Inspector-General (Headquarters) National Security Guards (NSG), Major Sandeep had exposure to counter insurgency operations after having served in Jammu and Kashmir for two terms. He was deputed to the NSG on January 20, 2007 and participated in various operations conducted by the elite force. A NSG commando with the 51 Special Action Group, he led the commando operation (Operation Black Tornado) launched on 27 November to flush out terrorists from the Taj Mahal hotel. As Unnikrishnan's 10-man team made their way through the hotel, they encountered a set of terrorists holding hostages who opened fire and struck Unnikrishnan's partner Commando Sunil Yadav. After arranging for Yadav's evacuation, Unnikrishnan chased the terrorists himself as they escaped to another floor of the hotel. In the encounter that followed, he was shot in the back, seriously injured and succumbed to injuries. His comrades recall his final words to them being "Do not come up, I will handle them." In the operation, Major Unnikrishnan is said to have rescued at least 14 hostages held captive by the terrorists. Let us homage to Major Unnikrishnan (15 March 1977 – 28 November 2008) with our work. The Hindu Civilsation has given birth to many sages and warriors over its long history to survive and this is a short story of one of its greatest sons mostly known only within Assam but unknown sadly among most Hindus themselves..
On 24 November each year Lachit Divas (Lachit Day) is celebrated statewide in Assam to commemorate the heroism of Lachit Borphukan and the victory of the Assamese army at the Battle of Saraighat. The event which is regarded as the keynote defeat of Mughal armies and the beginning of the fall of the Mughal Empire was the victory of the greatest Assamese Hindu warrior, Lachit Borphukan, who defeated the Mughals in the historic battle of Saraighat in April 1672. A desperate fight ensued in the jungles and the valleys where the people rallied by Lachit Borphukan and the Hindu monks of the land in a war of liberation. From the capital city of Guwahti to the depths of the forests the Ahoms fought and held back the tide of invasion. The proud warriors of Central Asia, Mughal and Pathan alike were foiled by the valiant resistance of the Ahoms. Apart from being the headquarters of the Mughal Governor in occupied Ahom territory, Guwahati had great strategic importance. The Brahmaputra river between Kamakhya and Saraighat is the narrowest at Guwahati and there are hills on both banks of the river in this area. The area was densely forested and road communications were very poor. The Brahmaputra waterway was the most important line of communication. A large army moving in this region had to make use of the Brahmaputra waterway. 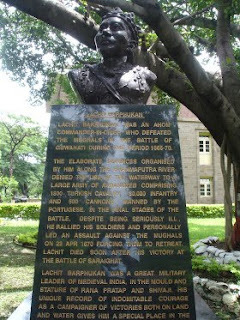 Lachit first struck at Bargoda fort at the junction of Bar Nadi and the Brahmaputra. The Mughal garrison was driven out from this fort and their counterattacks defeated. The Mughal reserves came up to the north bank and prevented further Ahom advance but could not dislodge them from Bargoda. Lachit Borphukan now shifted his attention to Sukreswar hill on the south bank where the Mughals had a fort, which was also the headquarters of the Mughul Governor. Ahom commandos managed to infiltrate the fort and neutralised the cannons by pouring water through their mouths and over their stock of gunpowder. This was followed by a heavy cannonade by the Ahoms and a determined assault of the fort. Sayed Firoz Khan, the governor, was taken a prisoner. The Mughals abandoned Guwahati. Lachit Barphukan now advanced down the Brahmaputra to Manas recovering all the Ahom territory ceded to Mir Jumla. A stone victory pillar in the Guwahati museum has an inscription in Sanskrit praising Lachit Barphukan for his great victory against the Mughals. An incident in the history of the Hindu Ahom resistance marks the spirit which animated their fight for freedom, when Lachit Borphukan, the Army General of Ahom king Chakradhwaj Singha had beheaded his maternal uncle for dereliction of duty while preparing to face the Mughals. His execution of his own uncle for not showing sufficient dedication to the war effort was not just an act of impulse but a reminder to his soldiers that in the service of one's Dharma. Mananeeya Eknathji says any great and noble achievement was just a vision in its primary stage. He expresses an eternal truth here. He says :Every great and noble achievement in the world was just a visionin its primary stage. It was a random will, a wanton dream, and an impossible ideal. There was nothing concrete about it. Landing on the moon was originally a vision only, perhaps the wishful thinking of a few fanatic ideologist physicists, and surprisingly for us, it has materialized in this very life. It has not remained a mere ideal. So also is the story of the Rock Memorial. It was only an idea originally, now it is a concrete reality. Thoughts, ideas and broodings over, remain as such if no strenuous efforts are put in to give them a shape and make them as concrete facts. The gorgeous bronze statue of Swamiji repeats the same tale. We wanted a Swamiji who had observed the whole country himself, had entered into meditation, had finished his brooding and had with a steadfast determination marched on for the fulfillment of his mission. For this we made a frantic search to find out a master painter who could embody our ideas in colours on canvas. We even requested the artist to read the life and literature of Swamiji in order to have a mental image and a correct insight into the life of Swamiji. For we wanted a personality who would make a real Prince amongst the Sannyasis, and not one with a feminine, tender form. The mind of the painter must be fully-charged with Swamiji's sentiments and thoughts so that he could imagine Swamiji giving in stentorian voice the rejuvenating message of Uttishthata Jagrata Prapya Varannibodhata (Kathopanishad) to the whole nation. When the painter successfully accomplished his duty, he was specifically requested to sit by the side of the sculptor and transmit his ideas about the details of the statue as he had by that time not only acquired a deep knowledge of Swamiji's life but had almost become one with it. Thus, the mere idea in the brain materialized in the form of the lifelike bronze statue. Mananeeya Eknathji now tells us about the Only Sure Help. Mananeeya Eknathji says the necessity of understanding the cumulative effect of the objective survey, a bird's eye-view, of the whole training period - the lectures and discussions - the higher values of life and some highly philosophical matters. The very first thing which arises before us is that the Vivekananda Kendra has planned a noble scheme which is lofty and fascinating in its objectives. Secondly, we feel that schemes are good for presentation and discussion, but they are most difficult to implement. As a matter to fact, that is not a solitary individual opinion, but the uniform impression of all. The third impression is that, the expectations raised during the course of the training are so frightfully high that one feels almost depressed. We once went to see the Bhakhra Dam. It is one of the biggest dams and we stayed there for three days. Thanks to the courtesy of the engineer, we got the chance of inspecting the different aspects of the construction work. This dam is built on a river which does not have a perennial stream of water. It is a seasonal river. But the bed of the river is so full of pebbles that the stream can better be called as a river of pebbles. But the ingenious engineer used the pebbles for better work. The huge storage of pebbles was used for the foundation of the dam. Conveyor belts were created and the pebbles were carried from the bed of the river to the place of the foundation. This was a contrivance to save time, money and energy. The pebbles are the best constituent of the concrete for the foundations. The pebbles were utilized for the more useful work of humanity and thus their life which was apparently purposeless for ages was blessed because of their worthy use. But as the pebbles were moving on the belts, some three or four of them fell down, again to lie idle for millions of ages instead of being used for the great noble work of the dam which was to irrigate thousands of acres of cultivable land to produce the nourishment and food for mankind. Let us not be like those unfortunate pebbles. Mananeeya Eknathji says : See the meaning and message in your birth and journey up to this point. Abide by God's proposals to make life meaningful. On this day of Mananeeya Eknathji - 19 Nov - His way of making life purposeful, meaningful, Sarthak is explained here in His own words. Everything is meaningful, and nothing is meaningless. The Creator has composed this great eternal book of the universe; read every page, every word, every letter of it and understand the thought underlying it. God has definitely proposed, designed something noble. We do not pay attention to it and spoil it through our ignorance. Temptations intervene and try to allure us. They also are designed to test us, to give us an opportunity to be aware of our strength and to overcome them. We must not merely surrender to everything like the deaf and the dumb, but must have an enlightened approach towards everything around us. Look around critically and you will find that every minute and insignificant thing in nature, has a message to deliver to you and that too, for your benefit and progress. One has simply to have a receptive ear and an attentive mind, to listen and to grasp the messages in the proper light and get liberated. Try to understand the meaning of everything around us. Why all the things are there? What is the meaning and purpose of them? Why have I been born? Why have I been brought to Kanyakumari? I did not ever dream of this when I was undergoing my education. Why and by whom have I been inspired to come here? Now that it is designed that I should be here, I have to shape my future in a worthy manner. I must have the right approach to everything. Many a time have I seen people miss their bus. Let it not happen to me. I am here in this ancient sacred land, and not in America or Germany. Why?... We have to look at the world around us in the right manner. Otherwise life becomes drab and boring because of the dull routine, day in and day out. It is an unrelieved monotony for many a people who lack this approach as they are not equipped with the acumen of looking through the external nature and grasping its meaning. Interpretation of the world around us and the happenings therein convey to us the eternal message which when followed in the right spirit leads to the good finale of each individual life. This is the only way to abide by the proposals of God and not to make light of them. When anything happens and when we are unable to trace the reason for it, we just pass the remark, "Accidentally it happened so, without rhyme or reason". But, we conveniently forget that there is a cause for everything. No effect takes place without a cause. What we stamp as an accident is really an incident, because it has a cause. That we are not capable of locating the cause properly does not make it an accident. An incident is a cumulative effect of so many things. Some of them may be visible, some invisible, some may be traceable, others may not be traceable. There is nothing like fate. It is the result of actions, if not of this life, of the past life. But the past is past, what about the future? It is in your hands. You are the architect of your future. It is no accident that you are born here in this status. It is the inexorable law of Karma, of action. "Reap as you sow" is the unchallengeable axiom. The present is the effect of the past and thus it is not in our hands as the past is past and cannot be altered. But the future will be the effect of the present and hence it is under our control to be moulded in the way we want to. What people term as good luck or fortune or providence or fate, does not exist apart from our present actions, as the future evolves from the present. Fortune has no independent relevance. It is just an idea in the mind. The main query should be, "Is it the proposition of God?" Do not call it accident; it is desired, ordained by God. It is the divine design and we are required to implement the same. "If it is not my desire and design, it is somebody else's desire and design and that is why I am here and not accidentally". This outlook is ennobling and pleasing. If we could not overpower the invaders, we should have, at least, fought with them, so that God could have taken care to do the rest. As He ordered Arjuna in the Bhagavad Gita XI.33. Nimittamatram Bhava Savyasachin "Be only a means, a tool." He does not use His power separately. He uses it through somebody. For that, let us be tools in the hands of Divinity. Let us be instruments, the strong, the alert and the dexterous willing instruments. He is kind, but He is kind to those who are kind to His progeny. Let us prove to be so. He has great designs to carry out through us. Let us implement them. What a great message! We have to understand that we are doing His works and therefore, giving up kartutva bhava, one becomes His instrument and do the work. We all therefore, should keep on reminding ourselves to be His instruments. Mananeeya Eknathji after telling about the great bounties that the God has showered on us says, God has proposed great things to be done by Indians. But, alas, the Indians have disposed His will. With a very feeling heart he says : But what is our performance? But alas! .......What is the performance of sixty crores (today 127 crs) of human beings breathing in this land? When we think seriously about this, we have to accept that God proposes and man disposes. It appears as though these people have taken a vow, or accepted a challenge to frustrate all the plans of God. God proposed that the people of this bountiful land should live the ideal life of human society and give a lead to the rest of the world. But they become slaves. In spite of natural defenses, there were invasions after invasions and always the great populace of this land surrendered before a handful of brute invaders and allowed them either to loot this land or occupy the territory and rule over them. The foreigners ruled over this vast country for centuries together and we, the sons of the soil, have taken great care, century after century, to dispose of the high-soaring proposals of God. Instead of attacking boldly and courageously the invaders, we have continuously and constantly used our power and strength in raising a war against the designs of the Lord. Our performance is so poor and so shameful that we cannot read history. We have to shut the book and think of what we are. Eknathji says God has favoured this nation in various ways. Natural boundaries, natural bounties have been showered on us. He says : For people not to get lazy God incarnated himself to guide them and this is yet another important aspect. The people had the feeling of complete safety and had no fear of invasion from any side. The affluent people under such circumstances naturally would get lazy and attached to sensuous pleasures only, remaining ignorant of their true self and also of the Creator. To avoid this, God sent savants after savants, saints after saints. His incarnations and emissaries and not satisfied with all these, He Himself came into this sacred land to awaken men to their true nature, duties and responsibilities. They all delivered the message of duty, what man was ordained to do, what he was expected to perform for the welfare and the final salvation of the individual and of society. Through the Vedas, the most ancient and primal lore on this globe, and the Upanishads, through the Mahabharata and the Ramayana, through the Bhagavad Gita and the manifold compositions of a number of holy saints in all languages, He preached to the people, the true essence of life. He did not send His son or a messenger, but He Himself descended among the masses not only once, but a number of times showing manifold paths to all human beings. He endowed these people with all sorts of bounty and left nothing short whatsoever at all. To protect our land from invaders God created natural boundariesfor us. This land of ours was affluent to the extent that the covetous eyes of all foreigners, the Greeks and the Ionians, the Moghuls and the Tartars, the Portuguese and the Spanish, the French and the British were on it. All of them marched into the country to plunder it in any way to their hearts' content. But God had taken special care to protect this sacred and prosperous land from such people. He created high impassable mountains in the north and unplumbed oceans on the three sides. The Hindukush, Karakorum and the Himalayas stand as natural barriers to protect the land. It was a natural defense and full protection for the prosperity and the treasures of this land from the greedy and the covetous people. When we do not succeed in any of our activity, we are in the habit of exclaiming, "What am I to do?" 'Man proposes and God disposes'. When we desire to do, God does not co-operate. It is an injustice. All this reasoning is sound apparently, but in reality what we notice is that "God proposes and Man Disposes". Take the example of our own country. There is no other country so beautiful and variegated as ours. It has all climates, all types of people, all varieties of land, all kinds of crops, vegetation, flora and fauna, fruits and what not. From the coldest snow-clad Himalayas to the hottest deserts, from the heaviest rainfall of 700 inches at Cherapunji to rainless regions of deserts, we have all variations. In food grains, rice, wheat, maize and other crops, all types of vegetables multifarious types of tender fragrant flowers, manifold varieties of large and small sweet fruits, woods and jungles, rivers and lakes, mountains and plateaus and all other conceivable varieties are found in this great land of ours. It rains incessantly and so torrentially at Cherapunji that the amount of rainfall is a record for the whole world, an annual rainfall of over 700 inches, while in other places, one has to be the proverbial chatak bird constantly looking skyward for a single drop of rain-water. Meghalaya is really the house of clouds. There are clouds and clouds only in the region. The roads and the houses, the fields and the lakes, the high and the low areas are all covered and enveloped by clouds, throughout the year. Looking at this panorama, it appears that God has taken a special care in showering and bedecking this land with all possible fancies of His creation and has not shown miserliness in any respect whatsoever. It is more than the Nandanavana of the heavens. There is no dearth of metals and minerals. In fact, the land seems to be flooded with all types of prosperity on all sides. However, what is our condition? Is it not proving God Proposes and Man Disposes? Deepavali ki shubhakamanye aur Pranams! Mananeeya Eknathji says : Ours is an organization, a missionary organization, a service missionary organization and this communion with the Self makes it is spiritually-oriented mission. This communion for half an hour gives immense strength and power, perhaps equal to that of one thousand elephants, for the rest of your Sadhana. We get an unparalleled delight and it removes the monotony of life. It charges you and changes you beyond recognition, not the physical form, but your outlook on life. Some more points which need to be kept in mind : Be prompt in correspondence and transparent in dealings When you move out, keep a note-book, and of course, the money purse. Every expenditure that you incur must be immediately noted to avoid confusion later on. Note any thought or word you remember. Never miss an appointment. Others may be late, but you must be in time. Never forget or delay in answering the letters that you receive. Delay results in denial and that is harmful to the social worker. Not to reply letters is turning the back to the public and this is ungentlemanly as well as ridiculous. We cease to have a personal life and every correspondence even to parents and friends must go into the office file. It should be recorded, as it is a necessary thing for a public worker. Having understood the importance of time saved, another important aspect that needs to be looked into is Regular Self-communion, its need and method. Eknathji says : Get up very early in the morning. Through practice, even an alarm clock will not be necessary. And after exercising the body, mind and intellect, have some Self-communion or Ishwarapranidhana. This inner Self did exist before it came to this land of action (karmabhoomi), and it shall continue to be there, even when this body is lost. From where have I come, where shall I go, why am I here – such question are to be meditated upon. This earth is a temporary residence and one day, we shall have to leave it. What is this "I"? If you spend half an hour in communion with the self, then what you do for the remaining twenty-three and a half hours is Sadhana. Do not be under the wrong impression about Sadhana, as told by others. It is all right for them. For you, Sadhana means this only and nothing else. If you do this Ishwarapranidhana early in the morning before you start your day's schedule, you are on the right track. You get the correct perspective and you move successfully. This is why in our Pratahsmaran, we chant....pratah smarami hridi samsphuradatmatatvam. That principle which is pulsating in our heart for all 24 hrs is to be remembered. This is the sadhana which has to be done in the early morning hours and the day has to begin. Again in the night, we chant shivoham shivoham.... with all good, bad happenings; success, failure in the various events and the sakshi bhava has to be recalled and proper understanding about ourselves has to be done. This is our Sadhana. Doing a thing efficiently is yet another factor adding to our credit of time and energy. If any work, may be accounts, typing or any work for that matter, is done efficiently, our time and energy is doing the same thing over and again, are definitely saved and we get so much of time and energy for other useful work. Yogasanas is an energy-storing process. If somebody gets exhausted and drowsy after Yogasanas it indicates that something is wrong somewhere. One must necessarily practice Pranayama and meditation for the health of the mind. The intellect does not lose energy. By rightly using it, it gets sharpened and more efficient. For this, we must have Swadhyaya. Swadhyayodhyetavyah Swadhyaya pravachanabhyam na pramaditavyam. The brain is never overworked or taxed. It is a false notion. In Swadhyaya, one must read thought-provoking literature like the Gita, the Upanishads and other sacred texts. Knowledge when given never decreases, but on the contrary, it increases. [When spent it (knowledge) always increases]. It is not lost when imparted, but is multiplied like the flame of the lamp which brings in more illumination by lighting other lamps without losing its own luster. The wastage of time can be definitely arrested. 1. Sleep is a rejuvenating factor. Even a machine has to be given rest. For the maintenance of this body-mind-complex, rest is essential. Rest is a must. The body, the mind and the intellect have immense potentialities. They can render tremendous work if they are properly used. We have no idea of the hidden capacities they possess. The intellect is to be used as a servant and it should not be allowed to be the master; because it can render positive arguments to support even your weaknesses. So, rest is necessary to keep the machine efficient. But, we have to decide how much sleep is necessary for this body. Only that much should be taken, so that we save the remaining time. This is time gained and therefore an increase on the revenue side of time. 2. Have enough exercise and asanas to keep the body fit, so that it works efficiently and smoothly and does not get any ailment. In the absence of a fit body, we suffer from ailments and sufferings in which time is lost again. We arrest this wastage of time and save the time as well as the energy, which otherwise would have been lost. This is again a gain. No suffering and no wastage means an abundance of energy, vitality and enthusiasm. You are Dhrityusahasamanvitah. Time and energy cannot be increased though the items of their expenditure can be enormously multiplied. Taking for granted that a man lives for one hundred years, which is of course very rare, the effective life is still less. The childhood and the period of education have to be deducted. Even in the remaining period, a man can be said to be effectively living, only till his sense-organs are working effectively and efficiently for some useful work. Otherwise, that period is not taken into account. He may have an effective and useful life for fifty years at the most. So the income side is fixed. Can it be increased? Apparently not. But we have to give serious thought and we find that we can increase the revenue. The proverb "Money saved is money gained" is well-known to you. In the same tune, we can say "Time saved is time gained". The same holds good of energy also. The time which is wasted in gossip, in sleep, in looking vacantly at the sky can be saved. The way a life-worker begins his day and terminates it is very important. As the man's life is packed in the two termini, the womb and the tomb, and his success or otherwise, depends upon the incidents in that life, so also a life-worker's day is entrapped between the beginning of the day and the terminus thereof and his efficiency is measured on the happenings of the day. We must have a fixed time-table for a daily routine. As the budget of a country or of an organization or of an individual indicates the gross income, stating therein the recurring, the occasional revenue and the gross expenditure, mentioning the items such as recurring and incidental expenditures, so also the time and the energy at the disposal have to be thought of and utilized very carefully. We feel that in a financial budget the income can be increased by additional taxes or extra income; but for an individual, life's span is very limited and the energy also not unlimited. Mananeeya Eknathji has tremendous confidence in Each soul is potentially Divine. And so, he says : A worker can do anything that he can conceive of. He can be a god and also a demon. But the will to change must prevail. The miserable note of "What can I do if I am not happy?" is not acceptable at all. Whatever is essential must be done. There must be willingness, a determined will to do. There is a parable that out of this strong will power man has acquired the six senses. "I will change thoroughly if necessary. I am dedicated and my work requires it. I can make my heart as large as the sky and I can banish all weaknesses which come in the way. Whatever makes me weak will be specifically avoided." This unconquerable will must be there. Morning, noon and night, nay every day must be spent in the pursuit of the ideal. Fashion your life accordingly. Be conscious about waste of time and energy. Utilize every moment of life and every ounce of energy for the allotted work. No efforts are too great to meet the demands of the work. A worker of the Kendra should get up early in the morning and by sunrise he must be up and doing, having performed his ablutions. If this habit is already formed, well and good; otherwise it is never too late to form it. We have taken this Vratam (vow) of "Serving the country". When people cannot cope with this hard new life, they put forward some excuses and return home. How sacred of us and of our vow! We have willingly accepted the Vratam and whatever is essential for the fulfillment of the same has to be executed. We have to change old habits and cultivate new habits to suit our work. A lamb cannot be a lion nor can a lion be a lamb. The kid of the lamb even though brought up with the lion cubs cannot jump at the elephants and pounce upon them. A lion, however, tamed, cannot eat grass. A lion is a non-vegetarian while a lamb lives only on grass. The nature of the species cannot be changed. A horse cannot go under water and swim and a fish cannot trot on the ground. A mouse cannot fly like a bird. But man can walk on ground, swim in water and fly in sky. He can do anything that he can conceive of. He can be a god and also a demon. But the will to change must prevail. Another important aspect Mananeeya Eknathji tells us is the conquering of the palate is essential. With palate - taste as well talk - controlled, many more things come under control and so, all efforts are needed to see into this advise of Eknathji. First, TASTE. The greatest stumbling block is food. Even Sannyasis have a taste for a particular type of food; if it is served to them, they are in their mood. Otherwise all their Gita and Upanishads go to waste-paper baskets. There must be peaceful control over the palate. We dislike certain things instinctively but this is wrong. We must win over this instinct, and not only we must suffer the un-liked food gladly, but we must start to like and even relish it. Tobacco and alcohol are not very tasteful things, but people get addicted to them. We must relish simple food prepared in a simple manner, whatever our host can afford. Ours is a poor country. If somebody tells us that the food should have so many carbohydrates and proteins and fats and so many calories should be eaten etc., it is all vain. All carbohydrates and proteins are provided by the cheerfulness with which you take food. Simple food becomes rich and vitaminized if eaten in a cheerful mood. Rich food becomes not only poor but even harmful if taken in a sullen mood. Be cheerful, receive any food with pleasure and relish it and you are more than a yogi. A rigid food habit is a weakness. One who is not fastidious about food has won half the battle. People get easily upset over food of a kind different from what they like. But they forget that 80% of the people who are depressed, downtrodden and poor, not only do not get this food, but they have not even seen the food that one fortunately gets. We are lucky that we get some food and do not belong to the above 80%. Do not have an aversion for any simple food. The daily life of a worker of the Kendra is an important factor. We have to readjust our habits of living. We are accustomed to a certain way of life but now we have to change the same. We must have the will to change, and insistence that we will be what we were before, will not be beneficial. We have received certain training, we have cultivated some habits and there has been a pattern in our development. If they continue to be the same in the changed circumstances, then, they are of no use. There is a doormat made of coir with the words, "Use me"; we also say, "Use me". But you cannot be used unless you are changed suitably according to the situation. People are proud about their habits and boast of taking certain vegetables, different dishes, tea in the morning etc. they claim that habit has become their second nature and that it cannot be changed. This change is essential but it cannot be brought about by any force. There must be willingness from within to give up old habits and adopt new ones. Adaptability is the best way. Intellectual people often speak of keeping late hours at night and getting up late in the morning. But there must be a conscious effort to re-pattern our life. People are in the habit of rejecting outright certain vegetables, but they forget that in doing so they expose a side of their personality. As a matter of fact, our attitude should be one of adjustment. We must be ready to relish all preparations with gusto. We should have no likes and dislikes when we are out for work. We will eat whatever is needed, whatever the work demands, whatever is proper. Old habits must yield place to new ones. The aspect which Eknathji tells in the very first chapter of Sadhana of Service : willingness to change, ready to change is again insisted as we come to the end of the lectures given by him. Mananeeya Eknathji says Be self –propelled, tap the in-exhaustible source of Divinity within and that is what will lead you to the goal. Knowing fully well that I have to fulfill my vow, I stand firm on my own ground and fight, so that no external power can frighten me. I need no help from outside nor do I borrow strength from anybody. How can we plan for our life only on borrowings from others? It is impossible. Borrowing inspiration from others is slavery. A youthful man marries a young lady. They live together but later on the lady gets sick of the man and leaves him. He is morose, gloomy and un-energetic. Why should somebody's life be dependent upon others? He has no inspiration and does not work. Our life should not depend upon external things. We have got our inspiration from the eternal source of energy. All other sources are transitory. When we live with this faith we have no death, we are immortal. Difficulties will always be there. We should not be perplexed. No depression in any case. Reach this stage; the sooner the better. There are people in the society who are ready to be propelled. Let the engine be there to take us, say, the bogies. Engines move the bogies; they do not require to be moved. If a super engine is necessary to move the engine then they are not engines. We are out to change the society in a particular direction. We must lead the crowd. If we become one of the crowd then who shall be the leader? We must be the leader and not one of the crowd. Our battery gets charged as we move on and on, and we charge other batteries. Here we are, what Swamiji addresses in Upanishadic words, "Sons of immortality" Amritasya Putrah. Here is the glorious incident from Maratha history when Tanaji with his brother Suryaji captured the difficult fort Kondana. In a duel with Udayabhanu, the converted officer of the fort, Tanaji was injured and he collapsed on the ground. The soldiers got frightened and started running to get down by the ropes with which they had climbed. Suryaji immediately cut the ropes and asked the soldiers either to jump down from the fort into the valley and die or to fight and win the battle. The soldiers had no alternative but to fight. They fought and won the battle. Tanaji died and Shivaji named the Fort as "SIMHAGADA" to commemorate the incident that the Fort was won, but the lion was lost. Do we require any Suryaji to infuse inspiration and to create enthusiasm in us or are we going to be Suryaji ourselves? When panic arises and depression overpowers there is a need of a Suryaji. Do we require him or we become Suryaji? We have to continuously introspect and give a clear thought to the situation. We have taken this difficult vow of service with a definite understanding and not on the inspiration from this man or that man. 'My enthusiasm and inspiration do not and should not depend on external situation. My battery can never be discharged and it will never require recharging. It is self-propelled and it can never bring any depression,' such should be the attitude.